One of the original 12 practices of Extreme Programming is “40 hour work week”, later renamed “Sustainable pace”. Atomic’s stuck closely to this practice as a company from our very first days. In a nutshell, it says individuals, and hence teams, will be most productive if they work at a sustainable pace. Sustainable pace acknowledges the world is not perfect. If you need to work beyond your sustainable pace one week, you shouldn’t do it the following week. In the industry that coined the term “death march”, this was a big deal. While sustainable pace is clearly valuable to the people on your team or in your company, the underlying motivation is the interest of the customer’s project and budget. Unhappy, stressed-out, tired, grumpy people don’t do their best work. They make mistakes. They cut corners. In the end, an unsustainable pace costs the customer money and jeopardizes project schedules. Overtime binges lead to bursts of output that exert a hangover effect in later days. Study after study indicates that short bursts of attention punctuated with equally deliberate breaks are the surest way to harness our full capacity to be productive. I found the graphs on productivity vs work hours interesting (the embedded slide deck is from Lost Garden). In particular, the shape of this curve appears to be the same across studies, which indicates to me that there’s an underlying explanation independent of the type of work or study done. That underlying commonality is of course the complex mix of physiology, psychology, and brain chemistry that defines each of us. I believe the results of these studies are even more relevant and important to innovation services firms because of the nature of the services they provide. The importance of creativity and the damage that poor quality can do strongly suggests that you want people working at their best all the time. I’m quite proud of Atomic’s record on sustainable pace. A while ago I wrote up some detailed suggestions for potential clients on how to effectively use an RFP to select vendors for software development projects. One of the elements I suggest looking at is whether a firm respects sustainable pace. The research cited in the Lost Garden blog post seems to confirm the wisdom of this criterion. As part of writing my RFP post I pulled data from Atomic Object’s time tracking system. The chart below shows seven years of data. The data charted is a histogram of the number of hours our makers (designers and developers) work per week. Over the last 7 years, our makers worked 35-45 hours per week 74% of the time. 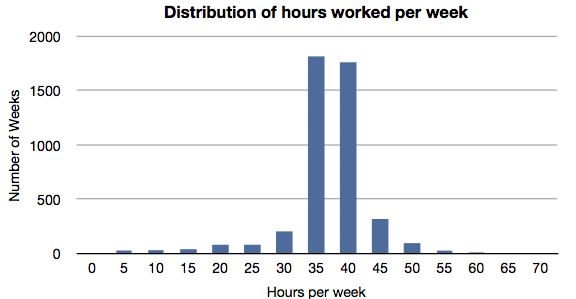 Distribution of hours worked per week shows Atomic makers stick closely to the practice of sustainable pace. Sustainable pace isn’t the only way to explain Atomic’s success, of course, but I think it’s a major contributing factor to our excellent track record, high employee retention, and creativity. As I mentioned at the start, we believe strongly in sustainable pace. It’s nice to see the research, our data, and our rhetoric all in agreement.